UKARMS Half Finger CQB Airsoft and Paintball Gloves Gloves are an ideal piece of kit for any airsofter to own. Not only do they look cool, but they also help protect your hands from any hazards you might encounter on the field. The flexible shield along the knuckle and back of the glove offer great impact protection against incoming BBs without restricting movement. The palm has ample amount of padding making ideal when traversing over rocks, small shrubs, rubble, BBs and other debris you might have to navigate through. With the half finger design, your dexterity is not hindered and allows you to manipulate your gear with little interference. 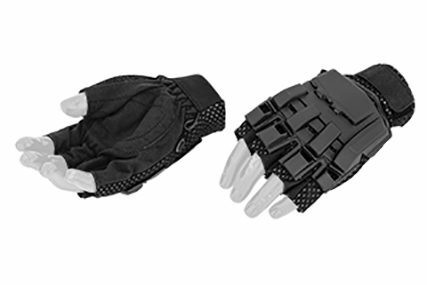 These gloves can be hooked together when not in use and features an adjustable velcro wrist strap.